We designed a pop-up exhibition stand that communicated Salima’s commitment to customer service thanks to clear messaging and friendly imagery of our client’s crew. 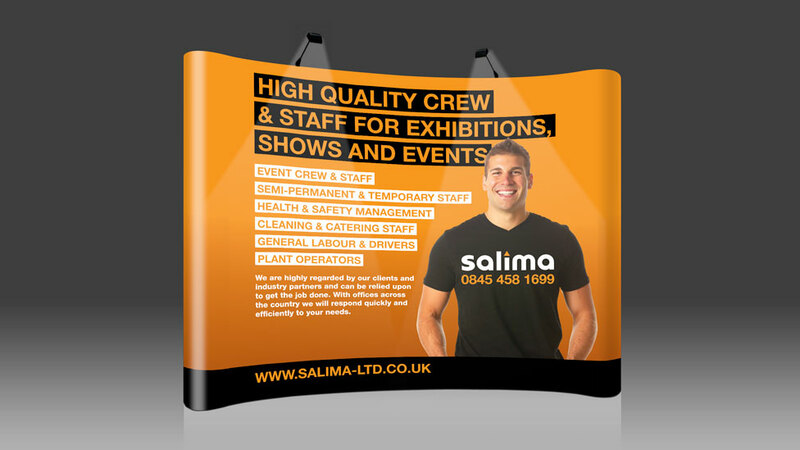 Salima supply event crew and staff for a wide range of promotions, product launches, sports events and concerts. They came to Parker Design with a brief to supply – as quickly as possible – a pop-up stand to help them promote their services at various trade shows. Using their strong corporate orange and black colours, we designed and produced high visibility pop-up banners with clean, friendly imagery featuring actual crew members. Printed on durable vinyl, the pop-up exhibition stand is lightweight and easy to transport between venues. The end result set Salima apart from their competitors, and has been used several times since. To transmit the benefits of the Bournemouth University lifestyle, and the culture of openness and collaboration it fosters, we designed a modular exhibition stand that is as unique and welcoming as our client. Having created the brand and produced sales brochures and data sheets, together with their company website, the next step for Parker Design was to create a portable exhibition design that would allow Sphere to take their brand out to the public.